Why isn't the Chair bringing this to a vote? Both the House Ways and Means Committee Chair, Delegate Anne Kaiser, and the Education Subcommittee Chair, Delegate Eric Luedtke, represent District 14 in Montgomery County, home to Maryland's largest and most influential school district. HB1110, the classroom screen safety bill, is now in the subcommittee's hands, but Delegate Luedtke has not brought it up for a vote. Is it because of a letter from Montgomery County Public Schools? "While well-intended, the requirement to consider and adopt proposed guidelines and procedures for the use of digital devices may, ultimately, contradict expectations of Montgomery County Public Schools to address the increased reliance and demand for digital tools in schools." Citing literature from the American Academy of Pediatrics (AAP) that does not apply to a school setting, MCPS also strangely fails to take into account the Maryland AAP's support of the bill. 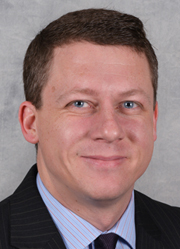 A majority of the Education Subcommittee supports the creation of statewide classroom screen safety guidelines, as do many of his Ways and Means colleagues, so why hasn't Delegate Luedtke brought it to a vote? It's undemocratic. There is no opposition and no associated costs. Just kids being protected. Right now, the youngest of children can be required by their schools to use digital devices literally from the time they walk into the building, until the moment they walk out again. From Kindergarten through high school graduation. Without any regulation whatsoever, even though OSHA protects workers under the same circumstances. 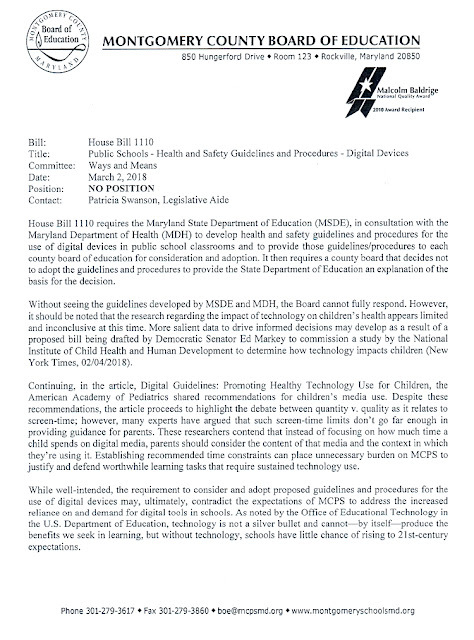 If Delegate Luedtke fails to bring HB1110 to a vote, he will seal the fate of children across the state, increasing their risk for myopia, dry eye disease, obesity, sleeplessness, anxiety, depression and suicide -- all related to the daily use of digital devices, according to researchers. He will also be ignoring the position of the state's medical community, 32 co-sponsors of the bill, and the fervent support of child welfare groups across the state, and across the country. How can one person deny the will of the people so flagrantly - especially when the health of children hangs in the balance? This bill ensures that the poorest kids in our state (not just the affluent ones in districts whose parents are well informed about this issue) have equal protections from the known hazards of classroom digital devices. The state owes all of its children a safe classroom, especially when individual school systems are ignoring warnings from physicians, pediatricians, occupational therapists, psychologists, optometrists and ophthalmologists -- all of whom provided written testimony supporting this bill. The statistics are already piling up - myopia, obesity and suicide rates are soaring among the nation's children. Researchers point directly to the use of digital devices as the culprit. It is unconscionable to fail to protect Maryland students, when the hazards they face are actually introduced by their schools. Delegate Luedtke, you alone will ensure that students are being protected, or harmed. Please put HB1110 up for a vote. If you let the clock run out on this bill, children will suffer needlessly.